LONDON, Ont. 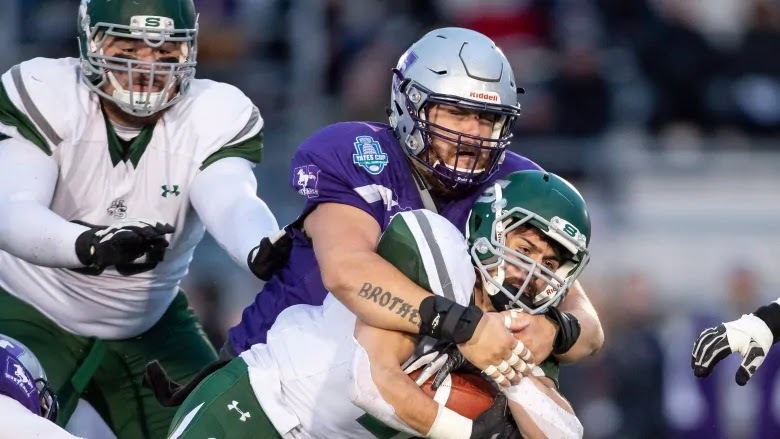 - Chris Merchant came back from injury to lead the defending Vanier Cup champion Western Mustangs to a rematch of last year's title game against the Laval Rouge et Or with a 47-24 win over the Saskatchewan Huskies in the Mitchell Bowl on Saturday. Merchant finished 17-for-28 passing with 251 yards and three touchdowns, including one on the ground, after getting hurt on the second play from scrimmage after Western fielded the opening kickoff. Merchant lay prone on the field for a couple of minutes, hobbling off gingerly with what appeared to be a back injury before returning later. Alex Taylor rushed for 141 yards and two touchdowns in support of Merchant, while Harry McMaster had 152 yards receiving and a pair of TDs. Kyle Siemens paced the Huskies with 256 yards in the air with two touchdowns, while Tyler Chow had 143 yards on the ground and a TD. Colton Klassen had 107 yards receiving and two scores, and Joey Trumpy caught nine passes for 98 yards. The Mustangs will face the Rouge et Or in the national championship game on Nov. 24 in Quebec City. Earlier Saturday, Laval romped to a 63-0 victory over the St. F-X X-Men in the Uteck Bowl to set up the matchup. On Saskatchewan's first drive, strong running by Chow and a spearing penalty by the defence laid the groundwork for 22-yard touchdown pass from Siemens to Klassen at the 10:06 mark.